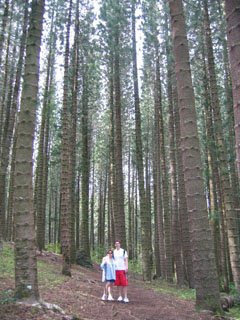 Looking for a quick stroll in the forest or for a refreshing swim? This is the ticket. Right off the Pali Highway, just outside of Downtown Honolulu, the Judd Trail is an easy hike that runs along Nu’uanu Stream to Jackass Ginger Pond and then continues in a 1 mile loop, with minimal elevation gain. 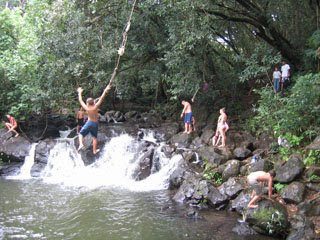 Jackass Ginger Pond is a great swimming hole with a 10 foot waterfall into the pond and a rope swing to jump from into the water, which is up to 8 feet deep in some places. Be warned that this pond is surrounded by boulders, which means there might be boulders in the water. Remember, “sticks and stone can break my bones,” so jumping is at your own risk. Those looking for more of a workout can take an alternative path to a higher elevation, Pauoa Flats, and finally Nu’uanu Valley Overlook (1600 feet) which has views of the Pali, higher peaks in the Ko’olau Range, the Wai’anae Range, Nu’uanu Valley, and Punchbowl. Do’s and don’ts: Do consider mosquito repellent or walk fast. Don’t try anything fancy off the rope. The 12th Annual Hawaii Kai Marina Association Boat Parade will be held on Saturday, December 20, 2008. It’s time for the spectacular 12th Annual Festival of Lights boat parade, coming to you on Saturday, December 20th, starting at sunset. Thanks to the hard work of Beverly Liddle, Hawaii Kai Marina manager, Beverly has once again put together a theme that will be a delight to young and old alike! Master of Ceremonies will be Mike Buck, host of the Mike Buck Show on KHVH News Radio 830. The judges this year will consist of members of the Hawaii Kai Marina community. This year’s parade will travel along the same route as last year. You can click here to see the route along the waterways. The three major shopping centers offer’s excellent viewing of the parade and will have entertainment. Come early for a good seat and an enjoyable evening. For boaters, you can get your entry forms for the parade by calling the Hawaii Kai Marina office during normal business hours. For the public, come early because the parking lots will fill up quickly, and shops and stores will be offering some exceptional deals and discounts. So don’t delay, mark your calendars, tell your friends and family about this spectacular east side event, Saturday, December 20th. We will see you all at our 12th Annual Festival of Lights Boat Parade! Happy Holidays! Our day hike was followed by a relaxing—sorta—evening with friends. It started at Judy’s place with her special peppermint, chocolate rimmed martinis. Then we were off in a hurry to hit the dance floor at The Kahala Hotel and Resort. Not sure if they really have a dance floor or not in their room called The Veranda. But we make one. David Swanson gets the crowd—mostly couples and groups from 35 years on up—swinging with his smooth jazz, including George Bensen and Stevie Wonder. We’re talking about canoes! Come out to Maunalua Bay in Hawaii Kai any morning and you’ll find a variety of dating opportunities. But ours starts with two one-man Outrigger canoes, very nice toys to enhance your dating life (unless you ram each other, flip over, or can’t stand the water). The Bay always reminds me of a Richard Scarry children’s book, with all of the different animal characters driving their cars, boats, and other vehicles around. There are folks in their motor boats, kayaks, jet skis, and surf boards all heading out to play in the ocean. Amazingly, we still saw wild life…a huge turtle that hung out under my canoe. Just beyond the last green channel marker and over toward China Walls (Portlock) is where dolphin pods and whales can sometimes be seen. Do’s and Don’ts on this date: Do chart your course to avoid missing the channel and hitting reefs. As part of Honolulu Chinatown’s revitalization, First Night happens on the first Friday of every month.Art galleries, typically closed during the evenings, open from 5 to 9 p.m. I thought that on this cold, rainy evening, most locals would skip First Night.I was wrong.Chinatown was hopping, from Indigo, where we started our date (and skipped the recommended Green Room, going to the slightly less crowded bar instead) to art galleries and 39 Hotel—where performance artists entertained us (and made me want to finger paint). Driving over Kalanianaole Highway into Hawaii Kai the day before Memorial Day, one can’t help but notice the island of boats and bright colors of floating devices with people bouncing on them. Welcome to Hawaii Kai’s boat tie-up party. Cool waters, good food and drink (bring your own), and Koko Head and Diamond Head views provide a great way to spend the day with friends and family. Anyone up to boating, paddling or swimming out to the event is welcome. You can tie up and tie one on around the island throughout the year: watch for flotilla boat tie-up parties off of Waikiki and at the Kaneohoe Bay sandbar on the Windward side of the island. Do’s and Don’ts: Bring food and drink to share, a designated driver, a swim suit, and good balance to get you from boat to boat. Don’t break up the tie-up by leaving in the middle of the day. because when I reached the Koolau summit after one and a half hours of hiking, it was clouded over. The route begins at the top of Mauna Lani Heights above Kaimuki. If you attempt Lanipo, be prepared to do some rock hopping in the first mile where the trail drops from its Maunalani Heights starting point into a low saddle and resumes climbing. Thereafter, you’ll be subjected to a long series of mostly ups and a few downs. Along the way, you can look down into both Palolo and upper-Manoa valleys. Near the top, you can look left into upper-Palolo Valley and see Ka’au Crater and a waterfall that cascades from a gap in it. Beautiful stuff, no doubt. This is not for the novice as it does require upper body strength to climb using some ropes and some steep and slippery areas. bring water, snack, and your cell phone in case of emergency. we did the hike in 3 hours, but most hiking books suggest 5-6 hours so start early in the day. do not get caught in the mountains in the dark. even with a light the ridgeline hikes have been know to eat hikers for dinner. Do you do the chicken dance?? I must be the only person from the Western World who didn’t know the chicken dance. Now I do…thanks to my good friend, Yolanda, who insisted we go to this year’s Oktoberfest at the Ala Moana Hotel. I was really tired as we headed out on the town. My plan was to have, “just one beer.” HA! We arrived at the top of the escalators to the Ala Moana Hotel’s ballrooms that was bedecked in German tradition. We seemed to be the only ones there. Yawn, I was in for a boring evening…until Yolanda bought $50 worth of script for food and for our “pitchers” of beer and “shots.” Gulp. Onward ho…to experience my own culture that I know nothing about—Welcome to Germany in Hawaii. About ten different German beers on tap were available, from the well knowns like Becks and Loewenbrau to Widmer. With our pitcher of Amber Bock, we entered the ballroom and were shocked to find it packed full of about 500 seated or dancing people, leaving us nowhere for us to sit. The band playing Edelweiss seemed to have been sipping at pitchers already and the people on the dance floor were doing something akin to the square dance (must be the Polka). Others were doing the Cha Cha, the Salsa, and some German-Hispanic hybrid. If you’ve been to an Oktoberfest, you know you are not allowed to just sit there. Between being beckoned to lift your glass and “brost” and act like a chicken on the dance floor, you also get to swap dance partners and watch people in blow-up St. Pauli Girl outfits shake their breasts at you. Goldwasser, Rumple Minze, Jagermeister…you might know the rest of the names of the “Schnapps Bude” shots you’re encouraged to take. I collected a few of those little shot glasses around my neck, made chicken beaks with my hands, flapped my arms, did the chicken boogy to the floor, and talked with everyone at the table, while tasting an assortment of food: Brotwurst; sauerbraten, black forest cake, German potato salad, spaetzle (authentic German dumplings), pig knuckle. Yum! Where: Hibiscus Ballroom 6 to 11 p.m. Here we go again, reviewing Rum Fire. Why? Because it’s the new, happening place in Waikiki. Located beachfront on Waikiki’s meandering boardwalk at the Sheraton, Rum Fire offers ambiance, entertainment, specialty drinks, ono food, and a few good deals. You can watch paddlers go by, the sun set, and hear great music some evenings. Hot, local musicians like Makana sooth your soul and keep a crowd gathered in the open air bar area. Even more fun though, is sitting outside on huge cushions with friends near a fire pit, which regardless of how hot or cold, melts away tensions. Happy hour specials are available every night. You can enjoy Meldown Mondays with their signature “1944 Mai Tai” and 50% off all drinks on HumpDay Wednesdays. Tapas (or pupus), range from crab cakes to ahi poke tacos. Our favorite Tapas to share with friends, though, is the Indian Curry Pot from the dinner menu. That along with a rum drink—in which Rum Fire specializes, is a great way to start or end the evening. If you stay for dinner, you can enjoy their Euro-pacific cuisine that includes wok fried specialties and seared island fish. Tiki’s Grill & Bar, located across from Waikiki Beach launches a weekly club night called Pink Tiki on Friday, November 21, 2008 at 10pm. Building on its current success of nightly live music, Pink Tiki will be featuring a DJ in the Ocean Room, drink specials, VIP Bottle Service, dancing and a late night class on drink making. A long time community supporter, Tiki’s has created a drink called “Pink Tiki,” and a dollar for every Pink Tiki drink purchased will be donated to the Queen’s Cancer Center. A unique pink ceramic tumbler will be featured on the daily menu to support the Queen’s Cancer Center on an ongoing basis. 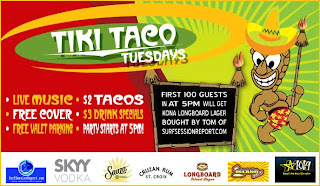 We are anxiously awaiting a visit for Tiki Taco Tuesdays. Stay tuned and we will let you know how it is. See you on Friday night!!! !